Special coupon for Dinuba Platinum Theatre at the end of this review. We recently saw Jurassic World and it was a really fun movie. The dinosaurs were amazing! Check out Jessica’s video review of the movie. 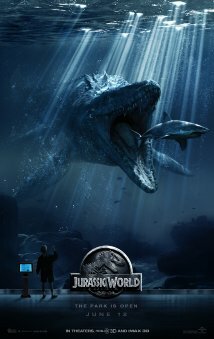 Jurassic World is currently playing at Dinuba Platinum Theatres 6. Showtimes can be found on their website. Platinum Theaters Dinuba 6 now proudly presents digital quality films in 2-D and 3-D with 5.1 Dolby digital surround sound to maximize your movie experience. Print this coupon and enjoy a special discount for Kings River Life readers only! Jessica Ham is 22 years old and an ongoing contributor; with dreams of being on Broadway, she’s right at home covering Entertainment. I have been wanting to see this movie. I completely agree with your comments about Chris Pratt! Thank you for the review.